Nine miles of tree-lined streets take you through a resort-style community that’s like no other. This 55+ paradise is tucked away in Ocala, Florida, one of the state’s top retirement destinations. It’s perfectly positioned in the peaceful country, but just minutes from amazing attractions like Ocala’s historic downtown. Rolling Greens is more than just a place to retire; it’s a place to be inspired. Our newly completed state-of-the-art Community Center is the hub of Rolling Greens. Featuring 12,000 square feet of activities, this hotspot features a coffee lounge, library, card room, billiards room and more! Love to swim? Our Aquatic Center includes a heated therapy pool that’s perfect for water aerobics, volleyball and general activity. If you’re looking for more rigorous exercise, head to the lap pool, with three regulation lanes. Relax on our luxury pool furniture in this outdoor oasis as you spend time with friends or catch some rays. Completed in 2016, our Athletic Fields are the perfect way to stay active, no matter what you love to do. 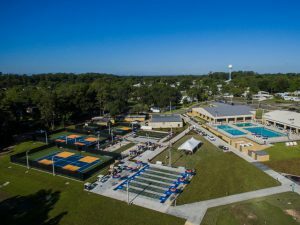 Play shuffleboard on our six lane courts, shoot some hoops, and enjoy tennis or pickleball on our lighted courts. Our attractive fields also include a bocce ball court and horseshoe courts for your playing pleasure. With year-round beautiful weather there’s never a bad time to enjoy the great outdoors at Rolling Greens. Get ready to break a sweat in our new fitness center. The cutting-edge Cybex International equipment is low-impact and perfect for all ages and skill levels. Watch TV on the large LED screens or listen to your favorite playlist while you work out. Afterwards hit the men’s and women’s saunas to unwind. You’ll love this spacious and spectacular fitness center, located right in your own community. Don’t miss our scenic 57-acre golf course. With weekly events such as tournaments, couple’s golf and mixed group golf, the fun keeps on rolling. If you get a hole-in-one, you’ll be featured on our board in the North Clubhouse and in the monthly newsletter! Each month, Rolling Green’s social director plans fun and engaging events, such as spaghetti dinners, dances, pickleball, water aerobics, painting classes, line dancing classes, poker games, golf tournaments, tennis, woodshop, and so much more. Look around our Facebook page to see what’s happening today. If you’re ready to become part of this exciting and vibrant community, we have some exciting news. Rolling Greens is proud to announce the arrival of brand new 2016 Skyline Homes. These homes are constructed with quality craftsmanship and material that’s sure to amaze. Skyline Homes is proud to present new 2016 manufactured homes that meet rigorous building, environmental and safety standards. These homes are not only beautiful, but are built to last. From the roof to the siding, you can be sure your home is top notch. To back the quality of their homes, Skyline offers warranties with their roofs (25 year prorated warranty), the durable vinyl lap siding (limited lifetime warranty), and even a 15 month full home warranty, which you can learn about below. Skyline Homes features floor plans and options to fit a variety of needs and budgets. At Rolling Greens, our homes include the following amazing amenities: *Please check individual homes for specific amenities. 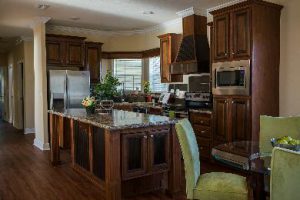 • Chef’s Kitchen with Stainless Steel Appliances including a side-by-side fridge and a cooktop oven. Save money on your electric bill with energy efficient homes. 2016 Skyline homes are built with high-tech floor, ceiling and wall insulation that help keep the home cooler in summer and warmer in winter. Skyline is an Energy Star partner, which means they’ve used Top-Grade Insulation, Extensive caulking and tight construction to eliminate unwanted drafts, High-Performance Windows and Doors, Use Energy Star approved materials including low-escape air ducts, so you can be sure your home meets energy efficient standards! Love the environment? Manufactured homes produce 30-40% less waste than comparable site-built homes. Skyline Homes has a commitment to going green and they build under strict environmental policies to help protect the earth and create beautiful homes in the process. You can learn more about their green building policies by visiting their website. Every new Skyline Home is backed by Skycare, a full 15-month warranty. This warranty is not partial or limited and includes coverage for manufacturing defects reported to Skyline within 15 months after original retail delivery by an authorized dealer will be corrected without charge and within reasonable time. See Available New Manufactured Homes at ROLLING GREENS! Learn How.There’s nothing better than buying a brand new home. One that’s never been lived in before, one that is only yours, one that you will create beautiful memories in. But you might find yourself missing some of that charm that older homes have. 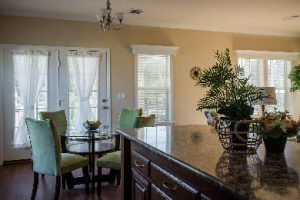 Today’s new manufactured homes have lots of charming features, but adding your own personal touches can truly make your house feel like a home. 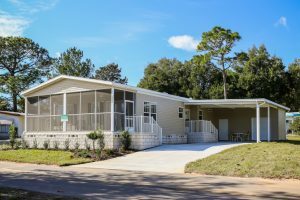 We’ve scoured the web for some quick and cost-effective ways you can add some character to your new construction manufactured home. THE DOOR- There’s something so quaint about a red front door (or any bright pop of color you like). It can add so much style and character to your home, and it’s an easy fix! You only need to paint the front, and it’s easy to spray paint the handle and knocker if they end up clashing with your new color. But you don’t have to stop there! You can replace other doors in your home too with neat antique finds or even paint those as well. Just remember, you can always donate doors or other fixtures you replace to Habitat for Humanity or other organizations. Learn How. THE CABINETS- Painting your cabinets can transform your entire kitchen. Decide what look you want to go for and then choose a color that fits. Today, most cabinets in new manufactured homes are solid wood, which means they will be easy to paint. As you can see in the picture above, the cabinets are newer and look nice, but the people wanted a cleaner white cabinet. Learn How. THE HARDWARE- This is a really easy and super cheap fix. You can change out the hardware in the kitchen, on doors, in the bathroom and anywhere else you see fit! Once you’ve decided on colors for the cabinets you can change out the fixtures to match. The picture above shows a great concept that someone did, which includes painted cabinets and stylish gold fixtures. Learn How. THE EXTRA ROOM- Many new construction homes come with dens or offices that don’t have doors. We love the idea of putting a large sliding farmhouse door in the entrance of your den or office. It will make it so the space can be separated if someone is working or visiting your home, but can also be left open during normal days to get the house a light and open feel. Learn How. THE NOOKS AND CRANNIES- You might find that your new construction home doesn’t have unique storage options. It may be lacking custom built-ins with character and charm that make homes feel, well, homey. Pinterest is full of ideas to convert everything from doors and closets to amazing nooks perfect for storage or displaying your favorite pieces. It can add some special features to your home that will make it feel custom-built. Learn How. THE BATHROOM- After you’re done painting counters and upgrading fixtures, you can give your mirror a face lift with this easy idea. Buy some stylish trim, and use it to build a beautiful frame for your mirror.It will have your bathroom looking luxurious in no time. But, you won’t want to miss this next tip, because it can help add an extra pop to your newly framed mirror. Learn How. THE LIGHTS- People have not purchased homes over something as simple as light fixtures.In this situation, you have two options. You can either paint your light fixtures to match your style, or you can buy new ones. As we suggested above, remember you can always donate this fixtures to Habitat for Humanity, or a similar organization, so they aren’t going to waste! You can see in the photo above how that light fixture went from drab to fab with an easy fix! Learn How.